Apicoectomy - Brockton Oral & Maxillofacial Surgery Inc. The teeth are held firmly in place by strong roots that extend into the jawbone. 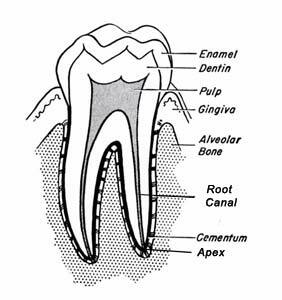 The central chamber or pulp of the tooth is composed of soft tissue which extends into the root to form the root canal. The tooth’s nerve and blood supply feed from the surrounding tissue through the root canal and into the pulp chamber in the crown of the tooth. A root canal treatment is a surgical procedure where the infected or damaged pulp of a tooth is removed and the canal and pulp chamber filled and sealed. Root canals are routinely performed to save an infected tooth and prevent further damage. Recent data from the American Association of Endodontists indicate that 95% of the more than 14 million root canals performed each year are successful. For the smaller percentage of cases where the root canal fails, patients will have leakage and infection at the tip or apex of the root. When symptoms such as pain and inflammation continue after a root canal, your surgeon may recommend an apicoectomy. In an apioectomy, the apex of the root is removed and then filled and sealed. Treatment of infected roots is important both to relieve current symptoms and to avoid the spread of infection which can damage other teeth and oral health. The purpose of an apicoectomy is to eliminate the often very painful infection of the tissue and ultimately to preserve the function of the tooth and avoid extraction. An apicoectomy will rarely be considered except when a root canal treatment has failed. Small Adjoining Root Branches – Diagrams tend to represent the root system as simple pathways. In reality, roots are complex and may contain many smaller branches or additional canals. Infection can persist when very small or inaccessible branches cannot be cleaned and sealed. Blocked Root Canal – In some cases, debris left by a previous root canal treatment blocks effective access to the canal. Further treatment by a traditional root canal is no longer possible. Narrow or Curved Root Canals – In some cases, the root canal is shaped so that endodontic files cannot reach into the root tip. Without full access and complete cleaning, infection can continue or recur. Generally, before surgery an antibiotic or anti-inflammatory medication will be prescribed to treat the underlying infection. After an examination and the review of panoramic X-rays, your surgeon will carefully plan your apicoectomy. The apicoectomy is done in an office visit, generally under local anesthesia. After making a small incision, the surgeon will lift away the gum to expose the root. In some cases, a tiny amount of bone may be removed to fully access the root. Using ultrasonic instruments, the surgeon removes the root apex and all infected tissue. The root tip is filled and sealed to stop further leakage and finally the gum is sutured with several small stitches. Apicoectomy does not require an overnight stay, and you will return home with instructions for your post-operative care. Your surgeon will prescribe medications to help manage infection, discomfort and swelling. For most patients, post-surgical recovery is brief and full healing will be complete in just a few months. If you are experiencing pain or swelling associated with a tooth that has had a root canal, we encourage you to contact our office immediately to schedule an appointment.